The vandal - resistant AXIS Q3505 - V delivers HD TV 1 080p video at up to 60 fps, providing smooth video even when capturing fast movements. Wide Dynamic Range - Forensic Capture optimizes video, highlighting details and increasing forensic usability . 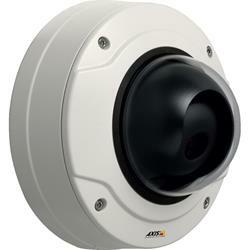 AXIS Q3505 - V supports Axis' Lightfinder technology , making it extremely sensitive to low light. It can transition seamlessly between handling WDR and low - light conditions. Electronic image stabilization greatly improves video quality when the camera is subject to vibration, resulting in smoother and steadier video. Leveling assistance guides the camera to the correct level, and auto rotation flips the image to the right orientation. Remote zoom and focus eliminate the need for hands - on fine tuning.